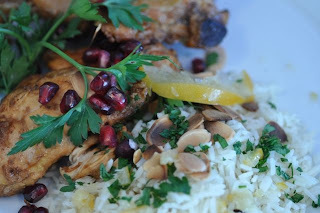 With fresh pomegranate season almost over in California, I picked up a pomegranate and a bottle of pomegranate molasses at Dean and Deluca and made a Middle Eastern-inspired, exotic and easy chicken and rice dish -- Pomegranate Chicken and Preserved Lemon and Almond Rice Pilaf. Several simple ingredients -- pomegranate molasses and seeds, preserved lemons, toasted almonds, cinnamon, cumin, pepper, clove, coriander, ginger, chicken and rice -- brought together in a way that is unusual for the American palate and uses relatively basic cooking techniques. The outcome is a meal that is tantalizing to the tongue. In my husband's words this dish is simply "luscious". If you're lucky enough to have a lemon tree in your yard or have a spare bag of lemons, it's easy to make preserved lemons (I've done it before) or pomegranate molasses at home. I will say this time of year is really tough for locavores, even lighthearted ones. It would be so easy to get into a food rut or quit being a locavore during the winter months. 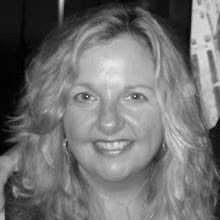 To get through until Spring, I'm quite a bit more flexible in what ingredients I cook with but I still try to source a huge percentage of my main ingredients from local farms or at least organic and/or sustainably grown foods from other (near and far) regions in the USA. Today, I was uber flexible and used quite a few global ingredients (the pomegranate molasses is from Lebanon, and the preserved lemons are from Morocco), although the chicken and homemade stock were local. Wash and dry the chicken parts. Remove the skin from the chicken using a paring knife. Heat the olive oil over a medium flame in a large saute pan. Add garlic and stir one minute until golden. Add the chicken and cook 5 minutes. In the meantime, measure the spices in a small bowl and set aside. 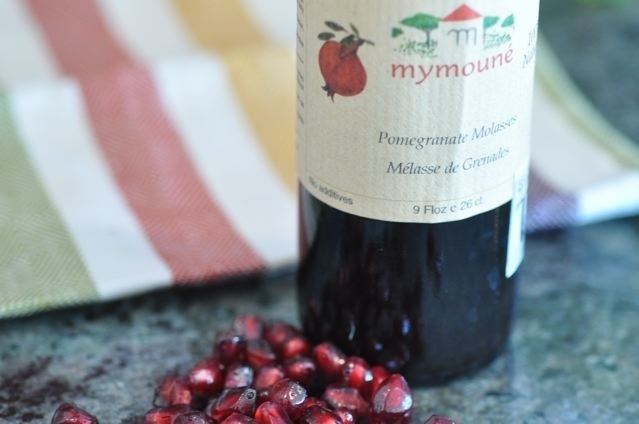 Mix the pomegranate molasses and chicken stock in a small container and set aside. Using tongs, turn the chicken over and cook another 5 minutes. Sprinkle the spice mixture on the chicken and pour the chicken stock and pomegranate molasses mixture into the pan. Cover and simmer for 30-40 minutes until the chicken is tender. Use the pomegranate seeds generously to garnish. Boil the chicken stock in a small pot that has a tight fitting lid. Add the rice, cover and reduce heat to simmer. Cook according to directions, about 25 minutes. Stir in almonds, preserved lemon and parsley right before serving.